Judged "Best Country Hotel 2011" by Hospitality New Zealand (HNZ). Come share our secluded village and beautifully restored landmark Hotel to see why. Situated in the heart of Karamea, we are the first service off the Heaphy Track. Surrounded by the Kahurangi National Park, we offer a world of natural wonderland experiences, or just a holiday "away from it all". We have 9 modern units separate from the Hotel, 3 with cooking facilities, the others being ensuite units, and all are serviced daily. There is also a 3-bedroom self-contained tourist flat offers families and groups a home away from home. 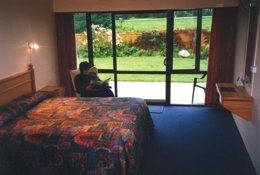 The Hotel is a great base for the many activities and adventures in Karamea. A short scenic walk from the Hotel you'll find the beach, estuary and river access. When it's time to relax and refuel, enjoy our selection of tasty meals inside by the open fire or outside in our snack and chat bar areas and award-winning gardens. Daily blackboard specials will delight you with affordable traditional home-cooked food. 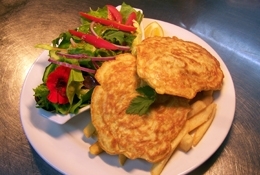 Or dine at our refurnished award-winning restaurant and see why we really are "Famous for Whitebait". Chef Chad will delight you with hearty seasonal fare. His speciality for the winter months is Tangy Hogget Neck Chops braised in tamarillo and served atop moi-moi potatoes and a root vegetable rosti. This is currently entered in the Hospitality NZ awards 2013 for Best Lamb Dish under $25. Diana has a great knowledge of the district and a long history of providing exceptional service for guests. 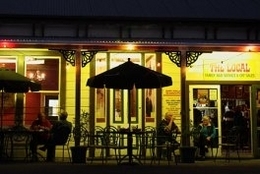 For over 28 years Karamea locals and delighted tourists from around the world have enjoyed Diana's true West Coast hospitality. The friendly staff and relaxed environment will make your visit comfortable and memorable.